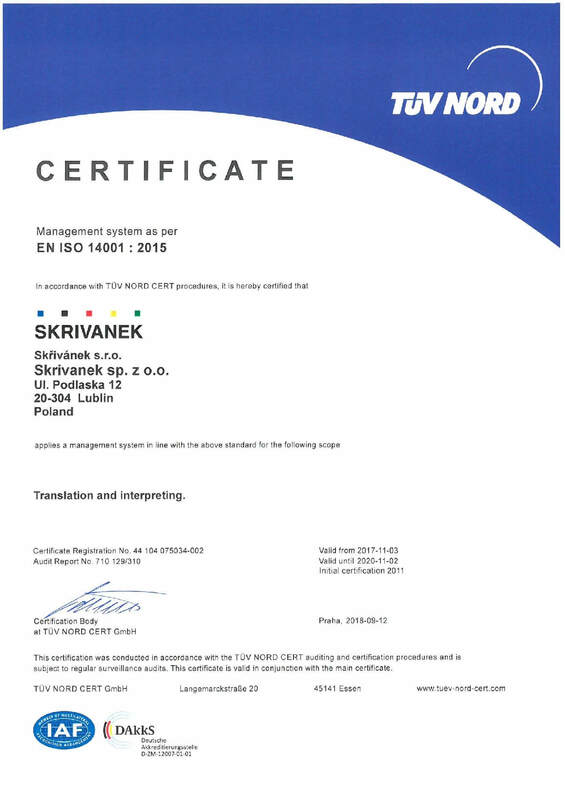 In November 2011 we were awarded a certificate confirming that our company complies with the ISO 14001:2015 standard. Although the standard does not strictly relate to our principal activity, that is translation, interpreting and language courses, we chose to implement it anyway, driven by our concern for the environment, as well as the standard’s tremendous impact on improving the document flow and communication processes in the company. What is the role of this standard? Standards in the ISO 14000 group cover various aspects of environmental management. Under the standards, companies and organisations interested in reducing their environmental impact are provided with useful tools to help them improve their environmental performance, thus reducing their pollutant emissions. The norms ISO 14001:2004 and ISO 14004:2015 focus on environmental management systems, while the remaining norms in the group cover environmental aspects such as life cycle analysis, communication and auditing. ISO 14001:2015 sets out the criteria for environmental management systems, with organisations satisfying these criteria awarded a relevant certificate. The guidelines for environmental performance established within the norm are not expressed as strict criteria, and instead constitute a basic framework for organisational conduct which should be used to implement an effective environmental management system. The standard can be adopted by any organisation, regardless of its industry. Compliance with ISO 14001:2015 assures the management board, employees and external stakeholders that the environmental impact of the organisation is actively measured and minimised. Improving the image of the organisation with local authorities, clients and the public at large.